Published in Geology, new research led by Monash University geologists has detected the first evidence that a passive margin in the Atlantic ocean is becoming active. Subduction zones, such as the one beginning near Iberia, are areas where one of the tectonic plates that cover Earth's surface dives beneath another plate into the mantle -- the layer just below the crust. "What we have detected is the very beginnings of an active margin -- it's like an embryonic subduction zone," Dr Duarte said. "Significant earthquake activity, including the 1755 quake which devastated Lisbon, indicated that there might be convergent tectonic movement in the area. For the first time, we have been able to provide not only evidences that this is indeed the case, but also a consistent driving mechanism." The incipient subduction in the Iberian zone could signal the start of a new phase of the Wilson Cycle -- where plate movements break up supercontinents, like Pangaea, and open oceans, stabilise and then form new subduction zones which close the oceans and bring the scattered continents back together. The findings provide a unique opportunity to observe a passive margin becoming active -- a process that will take around 20 million years. Even at this early phase the site will yield data that is crucial to refining the geodynamic models. 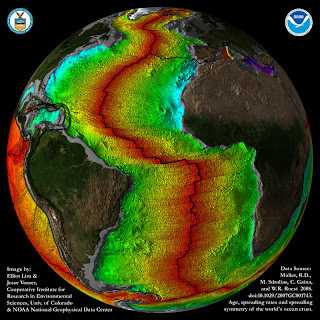 "Understanding these processes will certainly provide new insights on how subduction zones may have initiated in the past and how oceans start to close," Dr Duarte said.